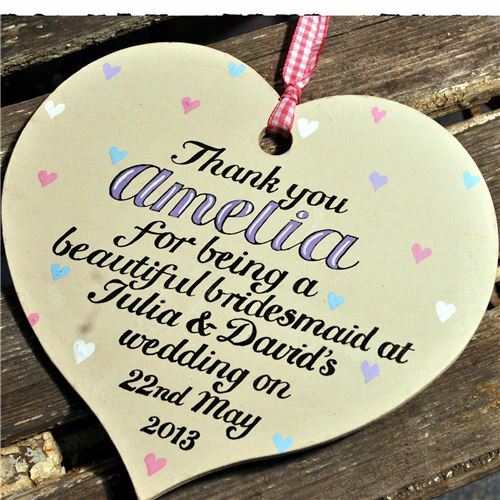 A beautiful hand painted wooden sign, a perfect thank you gift for your bridesmaid. This pretty hand painted sign will be a delightful keepsake for your beautiful bridesmaid. The sign can be personalised with the name of your choice, along with the couple's names and the date of their wedding. Please just let us know what you would like us to add when you place your order. This personalised hand painted wooden sign is made by Angelic Hen's artists here at our Wye Valley studio. The sign is made of wood and has a pink gingham ribbon to hang it up. As this sign is hand made to order please allow two weeks for delivery.